Glimmerglass Opera's farcical production of Handel's opera seria, Tolomeo, which received its North American premiere Sunday under the direction of Chas Rader-Shieber, suggests that opera directors using humor as a device to make Handel's dramatic works more relevant to modern audiences may, like the incorrigible Mr. Brooks, be working from a faulty model. To be sure, Handel possessed a sharp wit and a dry sense of humor that permeates his characters' personae (particularly those who find themselves in love with others, or themselves), and these characters provide ample fodder for humorous episodes in works such as Agrippina, Xerxes and Partenope. Yet while the implausible plot of Tolomeo may invite a certain degree of lampooning, there is also a strong underlying message honoring the nobility of character displayed by the eponymous Tolomeo and his wife, Seleuce (who throughout their hideous ordeal maintain their fidelity) that begs recognition. Rader-Shieber's unrelenting drone of parody, ridicule and satire — which for all practical purposes continued unabated throughout even the most tender and agonizing situations — all but robbed our hero and heroine of the ability to deliver the underlying moral of the story. Moreover, it was an unwelcome distraction to the beauty of Handel's music (which I believe stands up to the composer's best efforts in this genre). If only Rader-Shieber had used the element of humor as a tool to complement the dramatic action in this serious work (which, after all, is unfamiliar to a large majority of opera-goers). But no — he preferred to drown the story-line in a never-ending barrage of visual gags, kitsch and cheap laughs. In the end, it was Rader-Shieber's directing efforts that fell into the open sewer and died. As a purely musical experience the production fared quite well, with strong vocal and acting support from the dueling soprano roles of Joélle Harvey and Julie Boulianne, as Seleuce and Elisa, respectively — roles originally designed for Handel's super-diva contemporaries, Francesca Cuzzoni and Faustina Bordoni — as well as counter-tenor Anthony Roth Costanzo (Tolomeo), who sang the role originally cast for the celebrated castrato, Senesino. In Handel's day the principal focus of opera was the singers, particularly the castrati and soprano roles. Divas such as Cuzzoni and Bordoni provided the box office draw that could ensure a successful run of performances, and Handel (who always knew which side his bread was buttered on) gave the crowd exactly what it wanted in Tolomeo, keeping the musical focus squarely on the individual singers, without the 'distractions' of a chorus (unless you count the quintet finale as one) or ensemble numbers (just a few duets, and exquisite ones at that). The principal musical form during the 'reign of the singers' was the da capo aria, an ABA (ternary) musical form that invites (and in fact demands) improvisatory embellishment during the concluding (A) section. Disappointingly, ornamentation during the da capo sections throughout this performance was consistently understated, producing little or no change from the opening melodic section — a departure, to be sure, from Baroque performance practice prevalent during the time of Handel. As Tolomeo, the would-be King of Egypt exiled to Cypress by his malevolent mother, Cleopatra, Anthony Roth Costanzo forged a thoroughly sympathetic character whom the listener could readily understand and accept. Disguised early on as a common shepherd (Osmin), Costanzo sang the opera's opening aria (Cielo ingiusto, potrai fulminrmi), cursing his fate and the presumed loss of his beloved wife, Seleuce, with a rich and handsome counter-tenor that remained full and supple throughout the high and low registers. Although Costanzo tended to lag slightly behind the beat in the quickly paced sections of this aria, his well-seasoned voice quickly regained its agility for the remainder of the performance and culminated in solid precision-work during the running 16th-note passages of the third-act aria, son qual rocca percossa dall'aonde, which precedes the famous poison scene. I was especially impressed with Costanzo's wide range of emotions, both as an actor and as a singer, that enabled him to breathe credibility into his melancholic (and often suicidal) character. His aria Torna sol per un momento, an expressive lament at the conclusion of the Act One, was delivered with tender pathos and great attention to nuance. While I found Rader-Shieber's superfluous staging of Tolomeo's duet with Seleuce at the end of Act Two (Se il cor ti perde) a needless distraction (three butlers with wide-mouthed brooms interrupt the pair during this lovely duet and sweep the floor), I remain grateful to the director for suspending the comic shenanigans during Costanzo's compelling Stille amare, già vi sento, sung after he swallows what he presumes is poison. The professional jealousies and public feuding between Bordoni and Cuzzoni was legendary (the two actually came to blows during one performance), and Handel quickly learned it was prudent to dole out an equal number of arias to both (each has six arias in Tolomeo). Handel's parity of musical interest was plain to see in the efforts of the production's two sopranos, Boulianne and Harvey — each of whom commanded equal attention from the audience, and each of whom performed magnificently. As Tolomeo's ultra-faithful wife, Seleuce, Joélle Harvey carved a sympathetic character whose virtue was never in-question (although I had to wonder about the skirt designed by Andrea Hood, which shook to-and-fro like a slinky and at times threatened to fly off Harvey's waist). Her first-act aria, Fonti amiche, aure leggere, reveals a gorgeous soprano lightly seasoned with some darker timbres, and she crafts an expressive delivery that warms the heart. This aria was especially lovely in part because of the presence of two recorders, which Handel uses only sparingly. Harvey's silky-smooth delivery in the third-act Senza il suo bene la tortorella, a charming sicilienne about captivity, was upstaged by the unwelcome interpolation of three cages of varying sizes dangling in front of the soprano (a not-so-subtle reminder by the director that Seleuce, too, is in captivity of sorts). Kitsch or not, it was annoying to have to watch Harvey sing through this obstruction. One staging effect that I thought did work rather well appeared at the end of the opera during the wonderful duet between Harvey and Costanzo (preceding the quintet finale). To celebrate the happy denouement (and the removal of all obstacles to Tolomeo and Seleuce's conjugal reunion), Rader-Shieber has the two lovebirds undress for bed as they sing in happy intervals of thirds. The mood quickly proves contagious, as Elisa and Alessandro shed their clothes and follow suit. Not to be left out, Araspe removes his clothes as well — although he presumably will be making love to himself. In terms of memorable characters not likely to be forgotten for some time, Julie Boulianne, the darling of last year's successful Glimmerglass Opera production of La Cenerentola, came awfully close to stealing the show. Boulianne, whose outfit curiously resembled the 'Red Queen' character (played by Helena Bonham Carter) in the film Alice in Wonderland, was the only character among the five to play her part in a completely comedic vein — reconstructing the pernicious femme fatale of Handel's Elisa into something that resembles a spoiled, impatient club-hopping party girl. The transformation, whether orchestrated by Rader-Shieber or Boulianne herself, was in harmony with the satirical direction of this production. Although Handel designed this part specifically for a soprano, Boulianne's mezzo-soprano is sufficiently flexible and malleable to suit the part. Still, the darker timbre of her voice clearly sets her apart from the 'other soprano' role of Seleuce, putting aside any parallels to the legendary Cuzzoni-Bordoni feud. Boulianne's consistently well-executed ornamental passages throughout her many arias suggests a level of comfort with early 18th-century music. She performed the rapid ornamentations in the first-act Se talor miri un fior with grace, polish and poise, and navigated the trills and 16th-note passagework of the second-act Quanto è felice quell'augelletto with elegance and élan. I especially enjoyed her delivery of the heavily dotted-rhythms of her third-act aria of vengeance, Voglio amore o pur vendetta, which I feel was the singular most impressive vocal effort in this production. She also provided effortless tossing of the coloratura embellishments in the aria Ti pentirai, crudel that followed. The remaining two roles, sung by members of Glimmerglass Opera's Young American Artists Program, were hardly a match for veterans Costanzo, Harvey and Boulianne. Baritone Steven LaBrie, as Araspe, looked the part of the nefarious King of Cyprus and commanded an appropriately intimidating stage presence, although he remained rather weak in voice throughout a good deal of the performance. LaBrie's vocal delivery in his first-act aria (Respira almeno un poco) was tight and constrained, and he had difficulty mustering sufficient fury when his amorous intentions were spurned by Seleuce during the second-act quickly paced aria, Piangi pur, ma non sperare. The handsome baritone finally blossomed in the third-act Sarò giusto, e non tiranno, which he delivered in convincing fashion both vocally and dramatically. Mezzo-soprano Karin Mushegain sang the castrato role of Tolomeo's redemptive brother, Alessandro, with a smooth and pleasant vocal manner, although she too had difficulty projecting in both her first-act Non lo dirò col labbro and second-act Pur sento, oh Dio! che l'alma. Like LaBrie, Mushegain's voice came alive in the third-act, at which time she displayed a firm command of flexibility in her delivery of 16th-note ornamental passages throughout her aria, Se l'interno pur vedono i Numi. Donald Eastman's minimalist sets, which generally border on the bizarre, provide a suitable backdrop to Rader-Shieber's comical staging effects. When the curtain rises we see a mostly barren stage with a large, wind-torn umbrella shielding a small table upon which sits a goldfish bowl, and behind which stands a ceiling-to-floor vertical panel that displays a large swordfish. This is, ostensibly, the shipwreck beach scene that washes Tolomeo's brother, Alessandro, to the Cypress shore. Andrea Hood's theater of the absurd costume design, like the incongruous sets and props, is an assortment of non-sequiturs that includes 18th-century powered-wig servants' garb (the butlers) and Araspe's pimp-like reddish-brown jacket with fur trim and hat (and a protruding plume) that gives the King of Cypress a look better suited perhaps to Sporting Life in Porgy & Bess. Elisa's outrageous outfit, anchored by a skirt that looks as if it had been dragged through a tub of rainbow sherbet, may find its way someday into the Lady Gaga exhibit at the Smithsonian. A well-prepared, abbreviated version of the Glimmerglass Opera Orchestra, conducted by Christian Curnyn and buoyed by the addition of continuo of Baroque cello, theorbo (bass lute) and harpsichord, executed the pervasive brisk and sprightly 16th-note passages with alacrity throughout the performance. 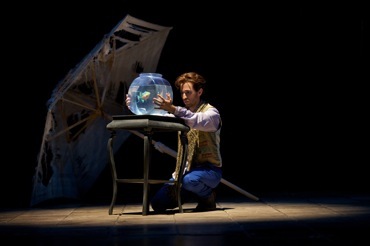 Photo credits: Claire McAdams/Glimmerglass Opera (first two); Karli Cadel/Glimmerglass Opera.